I've been eating a lot of yogurt and granola lately at work. I've discovered this expensive, delicious raw buckwheat granola, but am sick of paying $9 for a bag. I wanted to make my own, but I don't have a dehydrator to make this raw, plus I have too many raw food allergies. I found a few recipes online for regular granola with buckwheat in it, so I decided to just go for it. This was a good life choice, this granola is delicious and crunchy. I did add in some oats, but next time I might skip them. The buckwheat gets all crunchy, the millet puffs a little and is crunchy, and it's not too sweet. You guys know buckwheat is not a wheat-y gluten grain, right? Preheat oven to 300. Combine buckwheat, oats, millet, almond, sunflower seeds, and pistachios in a large bowl. In a smaller bowl, combine the honey, oil, salt, cinnamon, and vanilla, and whisk together. Pour over the grain mixture, and stir well. Spread over a cookie sheet, and bake for 40 minutes, stirring twice. Remove from the oven when the granola is golden brown. Stir in the dried fruit, and let cool. 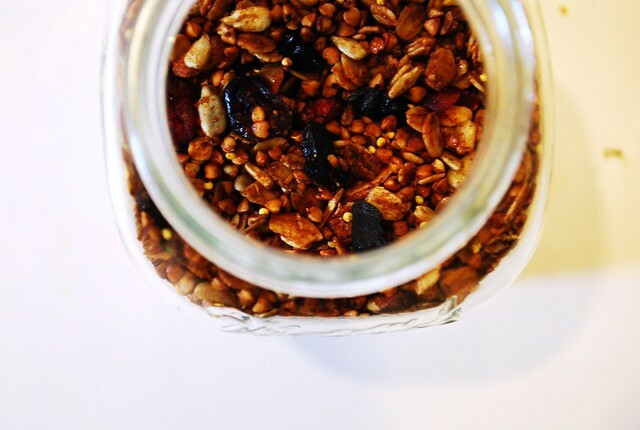 Sprinkle granola over yogurt and eat eat eat. So you don't cook the grains - buckwheat or millet? They somewhat cook in the oven? Are they still hard, or do they soften up a bit? This looks insanely yummy! Nope! The grains get all crunchy and totally delicious. I was skeptical but it worked! 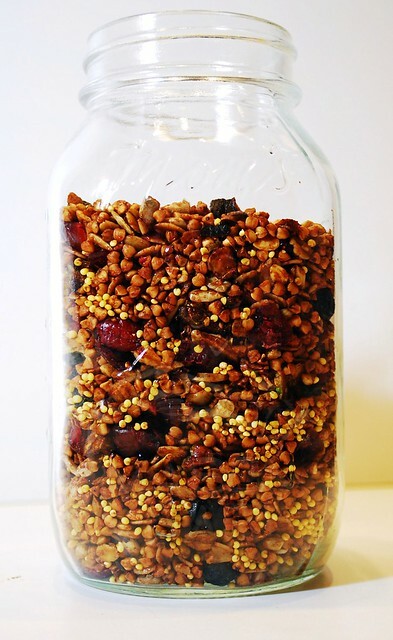 I just got a dehydrator yesterday and one of the things I really want to make is raw granola. I started making my own granola years ago, and really enjoyed it, but now that I'm trying to incorporate more raw and living foods in my diet I'm really excited to make some without cooking it. I've never thought of adding buckwheat, good call! I tried this and mine ended up burning even when I took it out at 20 minutes.... I'm really sad about it. Also, my millet didn't pop. Any suggestions?